Find bUseTextureStreaming and set the value to false. Game updates may revert these changes. All gameplay related save data is stored in Steam Cloud. Game updates may reset configuration settings. Statistics and Perk levels are saved in the Steam Cloud. No HUD centering. FOV set too high will invert viewport. 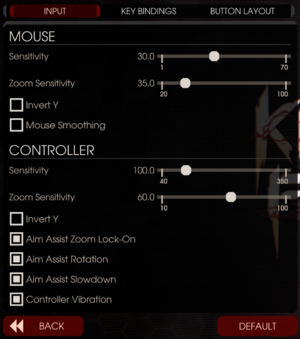 FOV slider is located in Game Settings. From 90º (1.00x) to 112.5º (1.25x) on the Horizontal Axis. Can be changed to use the Vertical Axis instead. Bilinear, Trilinear and up to 16x Anisotropic. Check Variable Framerate to get more than 62 FPS, the boss cutscenes are capped at 60 FPS. 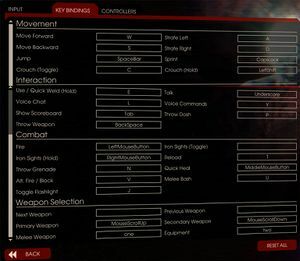 Acceleration/smoothing enabled by default. See Mouse acceleration. Movement goes from 0% speed to 100% speed. There is no in-between. Find bEnableMouseSmoothing and bViewAccelerationEnabled and set their values to false. Game updates may revert these changes. To prevent these changes from being reverted, go to the installation folder, find BaseInput.ini in \Engine\Config and disable smoothing. 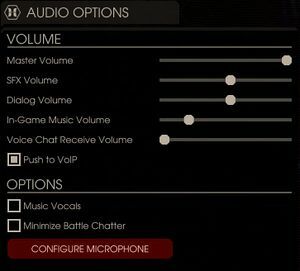 Next, find DefaultInput.ini in \KFGame\Config and disable acceleration. 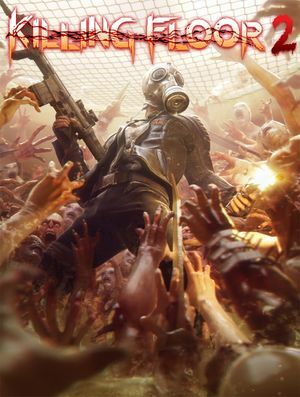 See Helix Mod: Killing Floor 2. This is usually caused by the graphics card not being supported or detected wrongly. 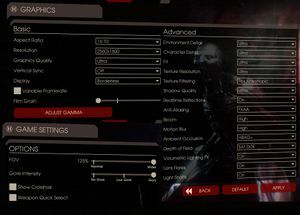 It is still possible to forcibly enable the Nvidia FleX feature, however system requirements for this feature increase. The new requirements can be found underneath the Nvidia FleX setting in-game or under the System Requirements section on the page here. Find the line starting with <OPTION Name="Flex", which should be located at the bottom of the file. Change the two lines to <OPTION Name="Flex" Registered="True" Type="Integer" Value="2">, <RANGE MinValue="0" MaxValue="2" NumSteps="2" />. Value="2" will control the setting, 0 meaning disabled, 1 meaning gibs and 2 meaning gibs and fluids. 10, 11 Graphics cards with lower than Direct3D 10 support are not supported. 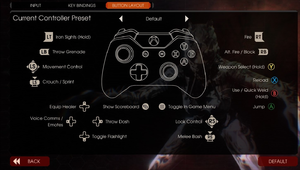 See the list of useful console commands. Intel HD Integrated Graphics Chips officially are not supported, but working. Nvidia FleX features minimum requirement is GeForce GTX 770, recommended requirement GeForce GTX 980. ↑ File/folder structure within this directory reflects the path(s) listed for Windows and/or Steam game data (use Wine regedit to access Windows registry paths). Games with Steam Cloud support may store data in ~/.steam/steam/userdata/<user-id>/232090/ in addition to or instead of this directory. The app ID (232090) may differ in some cases. Treat backslashes as forward slashes. See the glossary page for details.